We develop creative thinkers, incubate big ideas and advance innovation to solve society's most pressing problems. From purifying water to revolutionizing health care, producing clean energy to protecting our environment, the new generation of engineers has the knowledge and drive to transform the world. As one of the nation’s top-25 engineering schools, we are poised to have a remarkable impact on the grand challenges of our time, to create new jobs and to help drive the economy – but only if you join us. Together, we will create a boundless future where engineers will lead the changes that build a better world. The College of Engineering's campaign goal is $450 million. 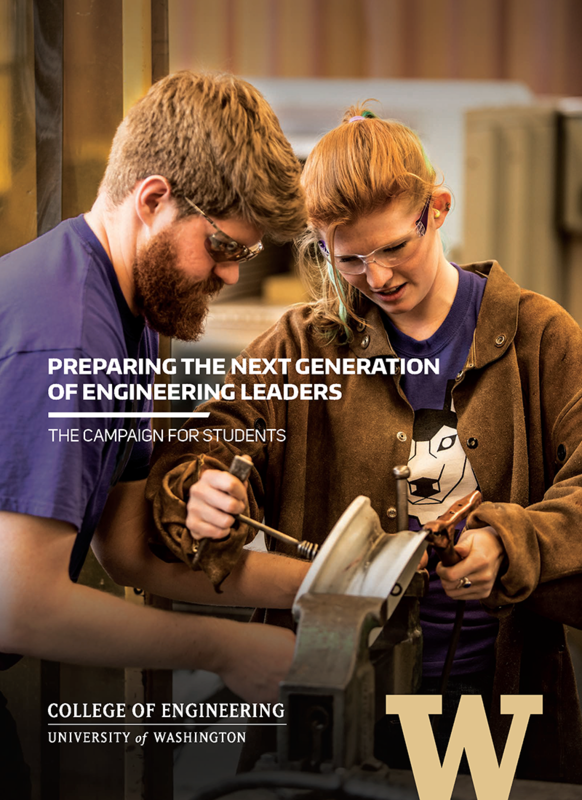 Learn more about our campaign progress in the Campaign for Engineering Quarterly Report. As part of the Campaign for Students we are raising funds for a new, interdisciplinary education building for our students, as well as upgrades to the Mechanical Engineering Building. Together, these projects represent the next phase in an ongoing facilities plan. Unrestricted gifts to the Dean’s Fund for Excellence go directly toward addressing the College's most pressing needs or are used to strengthen ongoing student or faculty programs. This fund provides need-based scholarships to engineering students from across the College. This fund provides financial assistance to graduate students in the College of Engineering. A capstone, or senior design project, is the centerpiece of an undergraduate engineering education at the UW. Gifts to Capstone Fund will allow students to pursue their professional interests, work in a team and tackle complex, full-cycle design—taking their project beyond the classroom or the lab and into the real world. Learn more about the Capstone Fund. Make an impact in the department that matters most to you. No matter what your passion, there is a fund to match. Learn more about the priority funds for each department. From the Ability & Innovation Lab to the Center for Neurotechnology, the College of Engineering is innovating novel devices to help people of all abilities live out their dreams. Private support makes amazing things possible. Hear from two engineering students about their research and educational experience and the impact of private support on their education. Financial support and diversity programs like MSEP helped Emilio Beltran succeed at the UW and as an engineer. Now in a position to give back, he wants to help students the way others helped him. 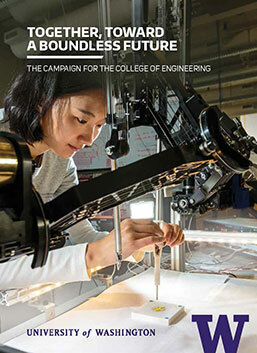 Click to open the College of Engineering Campaign brochure. Learn about the UW’s fundraising campaign.